A powerful tool for editing, adjusting, converting images. It also includes Batch Edit for processing large sets of images, HTML Album for generating albums ready to be published on the web and Desktop Extensions for customizing look and feel of your desktop. include hue, saturation, brightness, contrast settings, resize, cut, rotate and flip tools and 12 graphic filters (blur, sharpen, place in frame e t.s.). 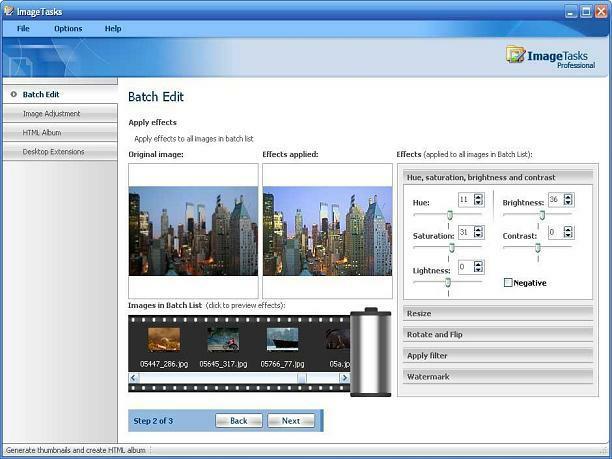 Batch Edit makes it easy to apply all this settings and filters to a large sets of images. ImageTasks supports 15+ graphics formats and can save your images as JPEG, GIF, TIFF, PNG and BMP. Also provides a full-featured HTML Album generation tool and templates. Algolab Raster to Vector Conversion Toolkit - Converts architect, mechanical and various technical drawings, maps and other types of line artwork including black and white graphics for books and journals from raster to vector formats. Minos Album 2.5.8 - Turn your photo collections into 3D realistic page-flipping music albums. Managing Photos into a 3D realistic page-flipping music album. Algolab Photo Vector - High quality color reduction, image cleaning and raster to vector conversion software. Creates vector color images composed of outlines. Animated Intro to Photoshop Elements(Mac)- Help-book for users of Adobe Photoshop Elements. Tutorials are illustrated with movie clips showing around the program.